The season of Lent in the Church’s calendar is a widely practiced, though often misunderstood, time. Many believe Lent calls for sacrifice and for “doom and gloom” -- forty days during which we deprive ourselves of joy until the celebration of the Easter Vigil. Traditionally, Lent has at its core three main practices: prayer, fasting, and almsgiving (charity). I'd like to propose a different view of Lent, one that still involves those three practices but that is guided by the example given to us by Mary. Mary has been venerated by many titles, and one that I'd like to focus on for this reflection is “Our Lady, Undoer of Knots.” This title comes from St. Irenaeus: “Eve, by her disobedience, tied the knot of disgrace for the human race; whereas Mary, by her obedience, undid it.” In a painting created in the 1700s, Mary is depicted with a rope in her hand. 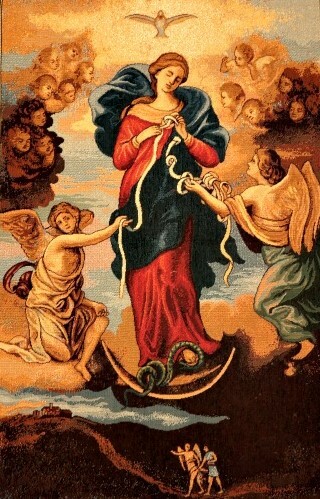 On one side of Mary, the rope is straight and clean, but on the other, it is knotted and tangled. Meanwhile, Mary has one of the knots in her hands, and you can see her at work untying it. The knots allude to the obstacles, temptations, habits, and behaviors that keep us from fully embracing the love and mercy of God. It is by Mary’s intercession, love, and example -- and, most of all, her help -- that the problems we face are undone and removed so that we are able to come to God and meet with Jesus without obstacles. Veneration of Mary as the Undoer of Knots has steadily been increasing in popularity, especially thanks to Pope Francis and his particular devotion to her. If you saw the short video message that Pope Francis delivered before the Super Bowl, you might have noticed that the painting hanging behind him was Our Lady, Undoer of Knots. So the question remains: How does Our Lady, Undoer of Knots fit with the Lenten practices of prayer, fasting, and almsgiving? The first focus of Lent is prayer. Prayer is at the heart of all we do. Prayer is an integral part of our daily lives, and one that must be stressed during Lent in order for us to further our relationship with Jesus, especially as we come to understand our redemption through His Passion. We find prayer difficult, though, and even religious Brothers and Sisters who have structured prayers throughout the day find prayer challenging. Thus, we look to Mary for help. Mary is a woman of prayer, and there is nothing that she would rather do than help us to communicate our desires, needs, fears, and joys to her and her Son. At the wedding of Cana, Mary shows us how to pray when she appeals to Jesus for help, trusting completely that God only wills the good for us. Mary’s prayer is a prayer we all have said and will say again, “Help us, for we have no wine” Or, “help me, for I have no patience.” “Help me, for I have no more will strength left.” “Help me, for I have no more tears.” “Help me, for I have no hope.” Whatever our need, Mary comes to our aid. Our Lady, Undoer of Knots takes our knotted prayer life and undoes it, helping us clear away the busyness and distractions that so often interrupt our communication with her Son. The second focus of Lent is fasting. Many people will chose a fast for the season of Lent, but the motivation behind these fasts can be confusing. Fasting is not meant to be a matter focused towards one's health, nor is it solely about denying yourself a good for the sake of penance. Mary shows us that fasting signifies humble obedience more than anything else. Rather than trying to prove how strong we are by giving something up, what if we saw our fasting as a chance to ignore those desires that are bad for us and listen for the plan of great love and joy God has for us? For this we have a great model, Mary, and her role as handmaiden of the Lord, when she said, “Be it done unto me.” At the Annunciation, Mary “fasted” from her plans, her ambitions, and the life she might have planned out for herself as she says “yes” to the motherhood of Jesus. We can take Lent as a time to “fast from ourselves” and let God speak to us. Hopefully, we can say, “Be it done unto me” and “Father, your will be done.” The feast of the Annunciation is March 25th, which occurs during Lent this year. This Annunciation, remember Our Lady, Undoer of Knots and offer her your knots of pride, anxiety, fear, and confusion about what to do with your life. By undoing these knots, Mary will help you to hear the voice of God, and with humility we can respond “yes” to what the Father asks of us. The last focus of Lent is almsgiving. A common act of almsgiving during Lent is to offer money in the parish “rice bowl” collection or, here at Chaminade, to participate in the Baby Bottle Drive. Mary, however, gives us a different idea of what it means to give alms. She shows us that service and building relationships are acts of charity that can impact those around us far more than just a monetary donation. Immediately after the Annunciation, Mary goes “in haste” (Lk 1:39) to visit Elizabeth her cousin and helps Elizabeth in her pregnancy. Mary abandons herself to the will of God through her participation in the Please continue to the next page. → Incarnation, which opens up the floodgates of love for her to pour forth on us all. Elizabeth was the first to benefit from Mary’s radical self-abnegation as she helps Elizabeth in her final months of pregnancy. When Mary arrives at Elizabeth’s house, she not only offers herself but has brought Jesus in her womb with her. Indeed, this is Mary’s role with all of us. She brings Jesus to us! Elizabeth knew it when her baby, John the Baptist, leapt in her womb at the sound of Mary’s greeting. We can experience this joy of having Jesus brought to us by Mary, and it is our joyful response to pass this gift along to another. Mary is our model for almsgiving, not in monetary ways, but in relationships. She makes herself present to us, and with her is always Jesus. We can be like that with our friends, with the stranger, and with those suffering and who need us most. Be present to those who need you this Lent, and know that Jesus will be there with you. Turn to Our Lady, Undoer of Knots, and ask her to undo the knots of selfishness, self-satisfaction, and comfort so that you can give everything you have for God and for each other, just as Mary did. So, as Lent begins this year, let us remember prayer, fasting, and almsgiving. Keep Mary in your heart this year and watch for the ways in which she undoes the knots in your life to bring you closer to Jesus. We here at Chaminade and Kellenberg will be praying for you all this Lent, and I hope you see the Mother of God always ready to embrace you as you journey through this life. Bro. Peter Francis Sennert, n. S.M.